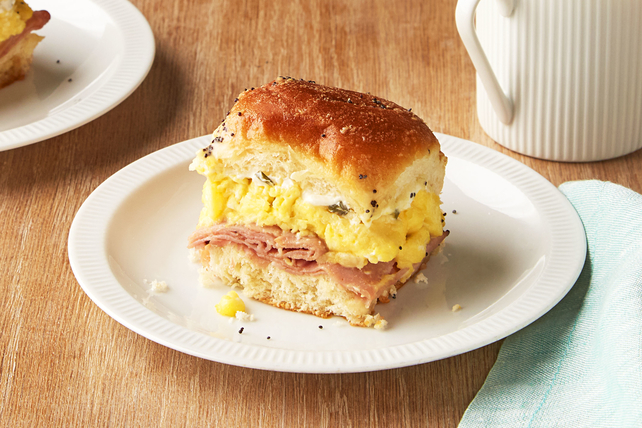 Make your next brunch one to remember with Ham, Egg & Cheese Brunch Sliders. These brunch sliders are perfect for celebrating any special occasion. Transfer rolls from package to cutting board, taking care not to separate rolls. Use serrated knife to carefully cut rolls horizontally in half. Place bottom halves of rolls, cut sides up, in 13x9-inch pan sprayed with cooking spray; top with folded ham slices. Whisk eggs and milk until blended. Melt 1 Tbsp. butter in large nonstick skillet on medium-low heat. Add eggs; cook 4 to 5 min. or just until set, stirring occasionally. Spoon over ham. Spread cream cheese product onto cut sides of tops of rolls; place, cut sides down, over sandwiches in pan. Microwave remaining butter in microwaveable bowl on HIGH 20 sec. or until melted. Stir in mustard and poppy seed; drizzle over sandwiches. Let stand 20 min. Heat oven to 350ºF. Bake sandwiches 20 min. or until heated through. Start your day off right with this quick entrée. Serve with a seasonal fruit salad. These simple, yet delicious, sandwiches can be refrigerated up to 24 hours before baking as directed. Prepare using Philadelphia Herb & Garlic Cream Cheese Product or Philadelphia Jalapeño Cream Cheese Product.